After being at work for the last 4 days, it felt good to be back on the water. Unfortunately, prior obligations for most of my fishing partners had be hitting the ice alone. The day before the weather made fishing tough. 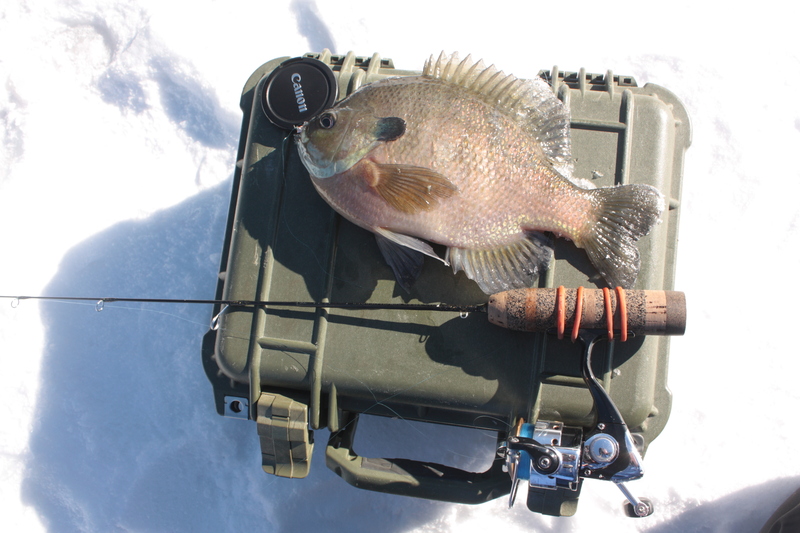 Although it was blue bird skies the wind and single digit temperatures made fishing outside of a shack almost impossible. For my trip, the same weather was predicted just a bit warmer. I arrived on the ice shortly before day light. By the time I was dropping my first line the sky was just starting to lighten up. At first the bite was good. Most holes held fish and most of those fish were decent bluegill. As I worked west the fishing got better. At least the amount of sun that was hitting me was better. The first time through the long series of holes over a thin weed bed produced the best results. When I worked back through productive holes I found that the fish were a bit more timid to my jig. To give the holes a rest, I hit a 9′ channel that runs through a good chunk of water. 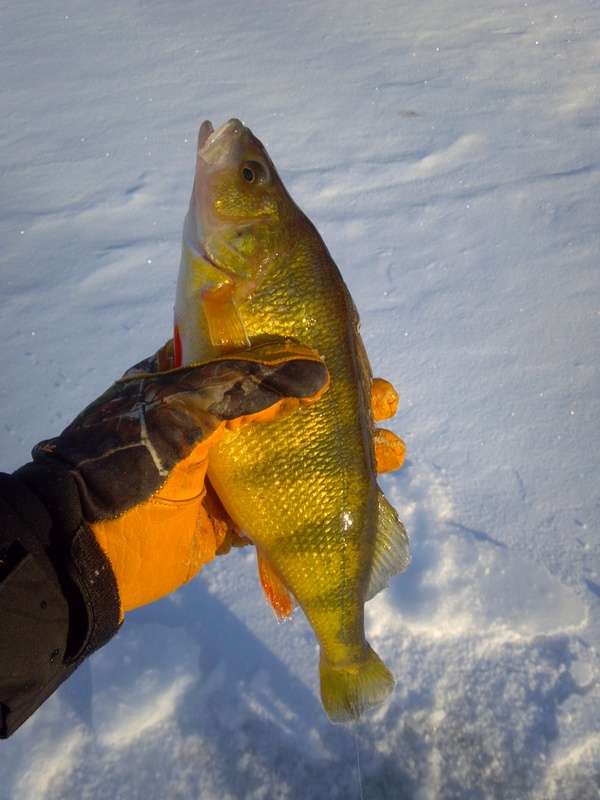 At one end I was able to catch a few perch and bluegill. The more I worked towards the center of the channel, the better the fishing got. As the pattern began to piece itself together, crappie began to come out of the holes at a much better rate. Unfortunately, all good things come to an end. The fish moved under a set of tip ups with an angler who was obviously less than impressed that other people were fishing anywhere near him. Knowing it was time to move, the initial weed bed was calling my name. The weed bed was loaded with fish but many were unwilling to bite. The bite throughout much of the day was slow but as long as I stayed mobile, I was able to keep icing fish. Looking around with my underwater camera, I realized how many fish there really were under the ice. Knowing what was there made it all that much more frustrating. With a slow bite I decided to go try a new area. With a few spots in my mind, I made my way to them. The first spot I checked was untouched from what I could tell. Not wanting to risk going out alone I went to another spot. I talked to a few fishermen who gave a report of a very slow bite. With no real motivation at this point in the day to go search out new fish, I went back to my original holes. The rest of the night was a good time on the water to watch fish but not to catch them. The majority of my time on the ice till dark was spent watching fish on my camera. Hole after hole, I had fish cruising high and low with no interest in my presentations. It didn’t take me long ditch my Vexilar and jig stick and just try to figure out what kind of movement the fish stick to. I was able to follow a pod of crappie for quite a ways before I called it a night. Hopefully with my new information, my next trip will be more successful! Nice to hear that I wasn’t the only one had a hard time catching fish on Sunday. Old-Times would blame the full moon for the poor…don’t know how true that is.